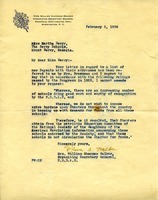 Telegram to the Berry Schools form Henrietta Von Noy, publicity chairman for the Pasadena Chapter of the DAR, asking them to send literature about the schools because their chapter of the DAR is to have a report on the schools that the National Society supports. 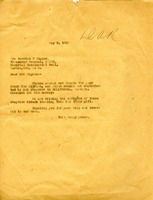 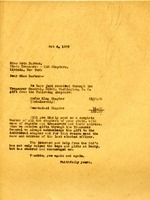 Flora A. Walker (Mrs. William Sherman Walker) writes to Martha Berry to inform her that she cannot give her the list of new Regents and their addresses that she requested. 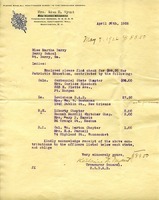 Mrs. Wyant, Treasurer General of the NSDAR sends a$88.50 check for Patriotic education and lists each chapter and their officer for acknowledgement. 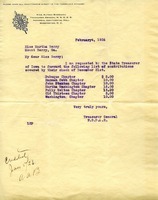 Listing of checks from Daughters of the Revolution Chapters by the end of December according to the National Treasurer of the DAR, Mrs. Alfred Brosseau. 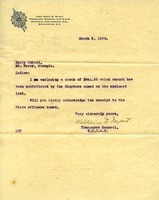 Martha Berry writes to thank Harriet V. Rigdon for the donation from the DAR chapters in Georgia, California, Missouri and New Jersey.